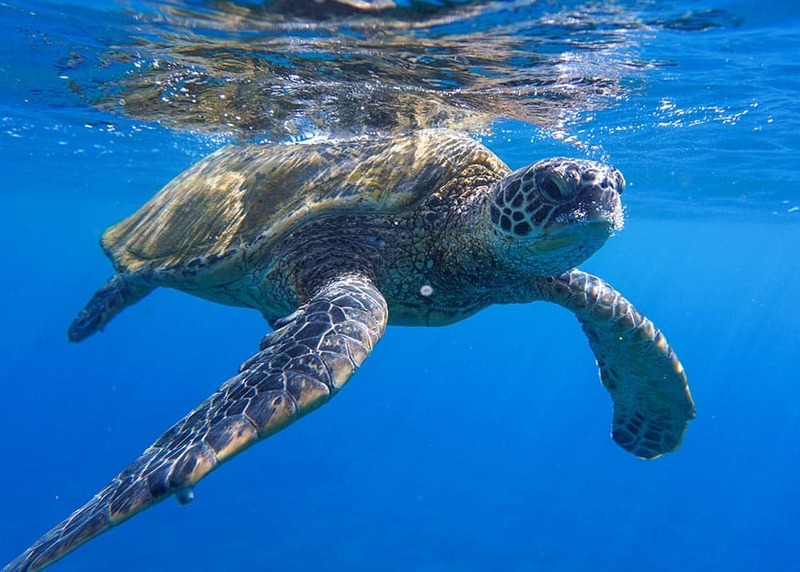 As you’d guess from the name, Turtle Town, located along Maui’s south shore near Makena Landing, is known for its large population of Hawaiian green sea turtles, called ‘honu’ in Hawaiian. While the area is accessible from the beach, it’s quite a swim from the shore but our boat brings you right where the turtles hang out. Your Seafari™ of the Turtle Town region typically begins at the Pinnacle, also known as Five Caves. The pinnacle is a 40 foot tall mound of lava and coral that has five large openings into a small cathedral where turtles are often found resting. If you can hold your breath for about 45 seconds, you can dive down to swim through one hole, the cathedral, and then out the other side for the thrill of a lifetime. Swimming east we then explore the turtle cave wall with large inlets and caves that are home to several large green sea turtles. Next we move on to Wash Rock, a cool area with an exposed lava rock that plunges down about 30 feet to an area with turtle caves at the base. Our guides often lead guests from the north side of the lava tube to an area along the shore where shallower coral serve as home to an abundance of sea life. Turtle Arches is a special area where underwater lava and coral formations leave holes large enough for turtles to secure themselves against tidal surge and currents, while exposing them to cleaner fish, who come by to snack on the algae on their shells. Watching all the activity at the ‘turtle cleaning station’ gives you a glimpse of what life is like for these gentle creatures in their life under the sea. One of the most majestic snorkel sites along the South Maui coastline is called the Sea Cliffs. These are lava bluffs with cliffs just as high above water as they are under the water. This surging shoreline can be one of the more adventurous and thrilling spots of our tour. Named for the rock just outside the cove that looks like a shark fin, Shark Fin Cove is a one-of-a kind location to explore. At the base of the largest cliff is a sand cave that is easily accessible to anyone who can dive and hold their breath for a little while. At 5′ high and 40′ in diameter, this sandy bottom cave is the hangout for a couple of unlikely roommates… a few harmless white tip reef sharks and two or three turtles. Here the turtles regularly come out of the cave to say hi. It’s an awesome sight to see and well worth the effort! Swimming past Shark Fin Cover we enter Makena Landing, which until the early 1900s was used as a shipping port for cattle being sent to the other islands and for receiving goods. When the trade winds are blowing, Makena Landing remains calm, making it a favorite spot to relax and have lunch while we look for turtles beaching themselves along the rocky shoreline. Since the turtles in this area are comfortable enough to approach a calm snorkeler, it’s tempting to touch or get very close to the turtles for a photo. Photos are encouraged but please know that touching, chasing or harassing our sweet honu in any way is forbidden by law and not ‘pono’ (meaning, to do the right thing).